Family history information and genetic testing can help us determine how often a person needs screening by colonoscopy*, and at what age to start. Colonoscopies are a wonderful screening tool! A colonoscopy is a procedure where a scope is used to look at the colon. If any growths are seen, they can be removed by the tools on the scope. These growths are what we refer to as a colon polyp*. It is important to keep in mind that not all colon polyps are equal. Some are just normal colon tissue that happened to look a little inflamed that day. Others can be what is called an adenoma, which is often referred to as a precancerous polyp* because we think if left to grow long enough, it could someday turn into a cancer. In this sense colonoscopy is the best tool we have against any cancer because it not only acts as a test to screen for colon cancer, but it can actually prevent colon cancer by removing colon polyps before they have a chance to turn into cancer. In most people we begin colonoscopies at age 50 and we know that a precancerous polyp takes a long time to turn into a cancer – probably more than 10 years! For this reason, people without a family history of colon cancer are often told they can wait 10 years in between colonoscopies if everything looks normal and no precancerous polyps are found. For most people, waiting 10 years in between colonoscopies will still allow us to catch precancerous polyps before they have a chance to turn into cancer. However, for individuals with a hereditary colon cancer syndrome*, we know that a precancerous polyp can develop and turn into cancer much faster. We also know that these individuals develop polyps at a much younger age than most people. For example, in patients with Lynch syndrome*, the progression from polyp to cancer can be much faster, so colonoscopy is typically recommended every 1-2 years for adults, perhaps beginning as early as age 20. In patients with FAP/AFAP/MAP*, the progression from polyp to cancer is not necessarily faster, but so many polyps are being made that a colonoscopy every 1-2 years is necessary to keep up with removing all of the polyps that are growing, perhaps beginning as early as age 10 in some families. For individuals without an identified hereditary colon cancer syndrome, colonoscopies may still be recommended more often based on other features, like the size/number/type of polyps found or family history. For example, a type of polyp called a serrated polyp* can grow from precancerous polyp to cancer more rapidly, so if this type of polyp is found, colonoscopies would be recommended more often than every 10 years. If many of these polyps are found, colonoscopies might even be recommended as often as every 1-2 years. For individuals with a family history of colon cancer, it is common for colonoscopies to be recommended more often than every 10 years. How often and at what age to start would depend on the age of diagnosis of colon cancer in the family, how closely related that relative is to you, and how many relatives have a diagnosis of colon cancer. For example, if you have a sibling or parent diagnosed with colon cancer under the age of 60, you may be told to start colonoscopies 10 years younger than the age of diagnosis, and do it more often. If my mother had colon cancer diagnosed at age 50, then it would be recommended that I start colonoscopies at age 40, and have one at least every 5 years. This is an extra precaution we take because in the absence of an identified hereditary colon cancer syndrome, we are often unable to say what caused a colon cancer in a family, but we know we can try to prevent it from happening in other family members through colonoscopies. The idea is to be sure to catch any colon polyps while they are still benign. Colonoscopies are not always the topic of family dinner conversations, but knowing your family history of colon polyps and colon cancer can help prevent colon cancer in other family members. Ask your family members about the results of their colonoscopies and any cancer history in the family. The bottom line is, a family history of colon cancer can help guide your doctors on how often an when to start colonoscopies. In some cases genetic testing can help us with our recommendations as well. 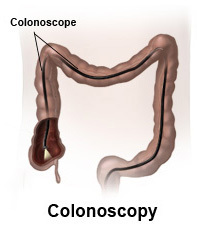 Colonoscopy: a procedure where a scope is used to look at the colon. If any growths are seen, they can be removed by the tools on the scope. It not only acts as a test to screen for colon cancer, but it can actually prevent colon cancer by removing colon polyps before they have a chance to turn into cancer. Colon polyp: Growths in the colon. Some are just normal colon tissue that happened to look a little inflamed that day; others can be what we call precancerous. Precancerous polyp: A colon polyps that has the potential to turn into cancer if left long enough. Often these are what we call adenomas. Hereditary cancer syndrome: a genetic mutation that can be passed down from generation to generation that increases the risk to develop colon cancer and other cancers greatly. Lynch syndrome: The name for a hereditary increased risk of colon cancer and other cancers caused by mutations in one of the following genes: MLH1, MSH2, MSH6, PMS2 and EPCAM. Men and women with the condition have up to a 75% lifetime risk to develop colorectal cancer. Women also have up to a 71% lifetime risk for endometrial cancer. Persons with Lynch syndrome are also at increased risk for other cancers that include cancer of the urinary tract, ovary, stomach, small intestine, hepatobiliary tract, skin, and brain. All three are names for a hereditary increased risk to develop hundreds to thousands of colon polyps and a greatly increased risk to develop colon cancer. They are caused by mutations in the genes APC or MUTYH. Other features seen include duodenal polyps, thyroid tumors, gastric fundic gland polyps, and other soft tissue tumors. Serrated polyp: A type of colon polyp that has a distinctive appearance when viewed under a microscope. Often described as a serrated, or saw-tooth appearance of the crypt lining. They are often considered aggressive and fast-growing polyps.